-__ previous Draenei and Tauren queries are processed. census captures via /who and display for levels 1-19 disabled. - fixes issue on mouse-over/ targeting of opposing faction player who is high enough to not display actual character level. - the above error would cause uploaded data to not get included into the www.warcraftrealm.com historical database. - reinstates minimal itIT and esES translations.. no one has helped by adding translations via the Curseforge Localization tool. 6.2.0.c - Update for Oceanic realm moves and other fixes. 6.2.0.a & 6.2.0.b - Update for Translations fixes. 6.2.0 - World of Warcraft V6.0.2 Pre-Warlords of Draenor initial release. 6.1.2.A - Fixed issue with Guild - Guild's Realm relationship not displaying under certain conditions. Added fixes for silencing and processing of 3 and under results. New methods have also been put in place to hopefully totally remove the who frame from popping and any taint errors from being thrown. If you happen to see either of these occur, please let me know. The total XP value has been changed to an XP Factor that will prevent the overflow problem of straight up summation of actual XP. The level bars in the mod are now shown on a logarithmic scale. A fix was added that prevents spam in battlegrounds if you have your autocensus timer set very low. Due to a strange crash bug when doing BG's and a census is running, I have updated CensusPlus to disable while in a battleground. Updated string search functionality so scans would not get stuck when 3 or less entries were returned. Unbeknownst to me, Blizzard has further localized classes and races in the client, making for gender specific terms. Thanks to SirCotare for his current efforts with the localization. Added a check when you first start this version that will remove all bad entries from your local database. Added checks to detect when /who results returned to the chat window have been modified by other mods. Added a check when you first start this version that will remove all bad entries from your local database created by the above issue. Removed the profiling information altogether, Arena does this for us now! Updates for Burning Crusade. Added races for Draenei and Blood Elf as well as increased levels from 60 to 70. Updates for patch 2.0. Removed the character profiler until it can be reworked. Updated API calls and LUA to be compliant with the new restrictions and requirements. Added an audible sound that can be played with the census is complete. In addition an option has been added to the options panel to disable this feature. Added a player list feature that will show you the list of players for currently selected filters in the display. This list is capped at 1000 players. Made efforts to removing the lag created when a census finishes. You will likely still see the lag if you have the Census window open when a census completes, but if it is closed, there should be no noticable lag. Fixed a hidden EU error. Many fixes pertaining to character profile data. Added per character option of saving your profile or not (under options panel) which is OFF by default. Added method for determining EU vs US regions (no more user selecting!). Also improved the Prune functionality to be more functional. Several other minor fixes and tweaks. Removed the Mini-census button and added a mini-map button. There is a slider under the options where you can move the button around the minimap to find an unoccupied position. You can also elect to not have the mini-map button present, but without it, no census data will be collected. The mini-map button is an unimaginative button with a `C` on it. You can now `deselect` a level, just as you could select a level before. This will allow you to do such things as remove lvl 60's from the display. You need to right click on the level bar to remove it and right click again to bring it back. Thanks to Tuatara for this addition. There is now a built in character profiler that will collect character data on your characters. This can be used to upload your character data to the site to be displayed as a character profile. You can see an example here: http://www.warcraftrealms.com/profile.php . The processing end on the site is not quite ready yet, but I will let you know when it is (very soon!). There will be a way to opt out of displaying a character profile when this part comes online. Other assorted tweaks and fixes, including updates for patch 1.8. Added a check to see if you are currently in a battleground when a Census runs, and if so, will cancel the snapshot. This is due to Blizzard only returning results for people currently in your battleground instance. Unfortunately, due to a data change with patch 1.6 that I did not catch until just today, all data prior will have to be purged from local user data. Not only that, but all PVP honor data will be reset on the site as well. Friends panel will no longer even attempt to open if the auto-close who is selected. This allows any other panels to be open during a census and they will not close or change your view. Added PVP Honor tracking. This will be viewable on the site soon. Modified the time tracking, cool new stats on the site to follow soon. Added in some regional server detection. Please note if you get any error messages detailing that the Mod thinks your locale should be set differently and let me know about them. Auto-census will no longer start as soon as you log in and will instead wait 5 minutes. Updated interface version number to 4211 which syncs up EURO and US versions. Added an initial selection dialog that will set your CensusPlus version to EURO or US. This MUST be set correctly for data to be reliable for US vs EURO servers. PLEASE PLEASE PLEASE set this correctly! I have absolutely no way to guarantee that the data I receive is from a EURO or US server so I am forced to rely on you, the users! Please don't let me down! Note that your set locale can be seen in the upper left corner. You should see either "Census+ v1.5" or "Census+ v1.5 EU" in the top bar of the Census window. Fixed a time bug issue with offset times if you had them set in Cosmos. This version should be nearly fully French and German localized with the exception of recently added strings. If you find the strings to be incorrect, please let me know as some of the translators have confessed not being 100% sure they are 100% correct. I will have another version coming soon with many requested features. For this release I was concentrating on finding as good a solution as possible for localization and handling of EURO and US data. Note: If you are a EURO player, when you start this new version, it will clear out all your previous data in order to make sure that uploaded data is reliable. If you change your locale, it will also purge your database to best maintain reliable information. Modified the way a census is taken. Instead of the divide and conquer style used that started a census with 1-60 and going from there, it will now start in 5 level increments and divide if necessary. Added guild support. The mod will now capture guild data when viewed on the guild panel. This data is used to provide more comprehensive data on the site and is available through the guild exports. Site related: Updated the way the site handles foreign languages and character sets. It should now handle UTF-8 compliant character sets correctly. Site related: Am now tracking data on characters under level 10, but you will only be able to view under level 10 characters on the character history and guild info pages. Under 10 info is not included in the main Census Display, the Quick Stats, or the Realm Stats pages. Site related: Added in realm information and guild exports. Info can be found on the Data Export page. Added a Most Wanted page showing the realms that have not been updated in the longest amount of time. This new mod saves additional information in the SavedVariables.lua file. WarcraftRealms is still able to process both the old version of the SavedVariables.lua file and the new version. I will continue to support all data collection methods. 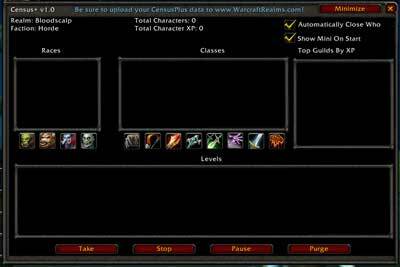 Unzip the files into your %World of Warcraft/Interface/AddOns directory. It should create a CensusPlus directory with the installed files. If you have Cosmos installed, CensusPlus will register itself with Cosmos and you can invoke the Census window by selecting the CensusPlus option from the Census menu. You can select to automatically close the Friends panel when it pops open when a /who command is executed. You can select to automatically display the Mini-Census button which must be visible in order for a Census to be taken while the main Census window is minimized. If you so choose, you can upload your collected census information to http://www.warcraftrealms.com Doing so will greatly help in the tracking of your realm and faction's population numbers and statistics. If you have any requests, comments, or suggestions, please post in the forums here.